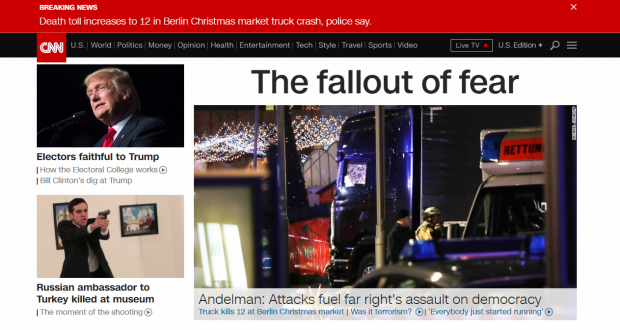 CNN’s online coverage of Monday’s deadly terror attack on a German Christmas market focused on the attack’s potential to stoke far-right anger, rather than the threats of Islamic radicalism. The headline leads to an article by columnist David Andelman, in which he warns not to let repeated Islamic terror attacks undermine the West’s commitment to mass immigration. In fact, the only proof Andelman offers that electing right-wing parties will destroy democracy is that many of those parties want to withdraw from the European Union, even though such a withdrawal, by itself, does nothing to make a country less of a democracy. “This is the ultimate danger of terror attacks. Reasonable men and women must recognize them for what they are — an effort to drain what is left of democracy from our nations,” Andelman warns. CNN’s front page also invited doubt over whether the attack was terrorism by using a “Was it terrorism?” headline, even though German news has already reported the attacker was a refugee, making terrorism the overwhelmingly likely cause of the attack.